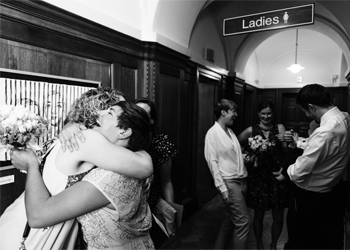 Emma and Maja met at rugby and threw themselves into planning a celebration that reflected the joyful spontaneity of their relationship. Emma looks back at a day to remember. Photos by Stephen Bunn Photography. 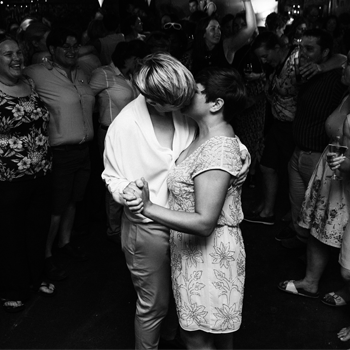 We met through playing for the same rugby team, the Hampstead Ladies, and were friends for several years before we got together. Seven years on, we still love watching rugby together, although we don’t play it anymore. I proposed in the Blue Mountains in Australia after planning for a year. Maja had no idea, even when we checked in to a beautiful cabin in the bush surrounded by parrots and amazing scenery. The terror of asking the question meant that I missed countless opportunities of sunsets all alone looking out over giant valleys etc. I had made a label for a wine bottle that said ‘will you marry me’ and in the end, after smashing that all over myself, I just went out on the deck and asked Maja. Afterwards I remembered I had a ring. A total disaster, but also perfect. Our dream was to have a wedding that we could invite everyone we loved to, without having to worry about money. We wanted it to be in London, near to where we all live, and we wanted a kind of warehouse/prohibition vibe, which is just our kind of style – relaxed, full of joy, and an environment that would make us remember for the rest of our lives that we were cool once! The date was kind of fun because we realised 4 July was one of the Saturdays around when we wanted to have the wedding. Half of Maja’s family is American, so we just called it ‘No more independence day’ and went for that date. This became our theme, which we put on little badges for people as part of their favours, and included fake moustaches. We had made a request that any guys who were able to grow beards and moustaches did so as ostentatiously as they could, so the fake ones were for everyone else. The décor was aimed at having a relaxed, prohibition vibe but with a bit of specialness – it was a wedding after all! 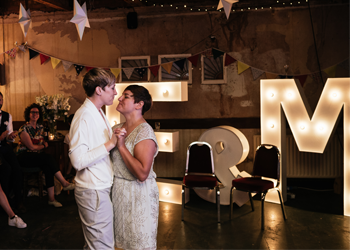 Edison lamps, festoon lighting, light boxes, bunting and homemade stars transformed the room. I wore a top and trousers both from Reiss, and Maja’s dress was from John Lewis. She realised half way through the wedding that the label was still on, so technically she could take it back! Maja wore her great grandmother’s hand-made white leather wedding shoes – which remarkably, fit her like a glove – to the ceremony and then switched into some more robust sparkly numbers for the reception. My shoes were silver brogues from Clarks. We both agreed straightaway that neither of us wanted to be in a white dress or a suit. Maja wanted to wear a dress, so her school friends took her out for a day of wine and shopping and found her dress that day in John Lewis. I didn’t see it till the day, but was told it was mint green so I could try not to clash. 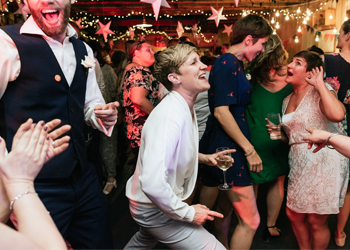 I knew I wanted to wear trousers, partly because it woul d be a month after knee surgery so I’d have a swollen knee, and partly so I could feel really comfortable and dance like a lunatic. Two friends took me on shopping trips, one to Westfield and one to Harrods. I never even talk to shop assistants normally, scuttling around with my head down, but we had outfit after outfit appearing at the changing room and it was a great experience. In the end I found my outfit on my own, but I never would have done so without the help and advice of my friends. We wanted the whole day to feel really personal and to bring out the right emotions in everyone at the right times, so we spent a lot of time and energy choreographing the music and choosing the readings. We arrived at the ceremony in one of the removal vans from my company, Van Girls. Of course we put ribbons on the front and one of the Van Girls drove us. We walked into the ceremony to London Grammar’s Strong, to make the hairs on the back of everyone’s necks stand on end. It still does that to me whenever I hear it. We sang, together with all our guests, Bridge over Troubled Water by Simon and Garfunkel in the middle of the ceremony. It was extremely moving. We didn’t write our own vows but chose the ceremony wording that felt closest to what we would write. As I used to be in the Fire Brigade, we had a guard of honour for us to come in through and for everyone to leave through, with their ceremonial axes raised. The readings we chose were Yes I’ll Marry You My Dear By Pam Ayres and an extract from Lighthousekeeping by Jeanette Winterson. The first was more light-hearted, and the second set me off crying before we’d even got to the vows. We didn’t have any bridesmaids. We walked each other down the aisle, with both our parents in the front row. We did have lots of help from friends and parents though – with our make-up, decorating the reception venue in the morning, driving us to and from the ceremony, making the cake, writing speeches, doing readings, etc. Maja’s mum got all the flowers from Covent Garden flower market and Emma’s mum made 40 metres of bunting! After the ceremony the guests got the 91 bus to The Earl Haig Hall, which is our local pub. We love it and go there a lot! It’s an old British Legion club with tons of character. They have a huge side room, which terrified our parents when they first saw it, with its peeling wallpaper and wonky lampshades but everyone agreed that on the day it looked amazing! A gang of our mates and our mums went there in the morning to decorate the room with fairy lights, photos, my mum’s handmade bunting, flowers bought by Maja’s mum, giant illuminated letters and tons of white paper stars made by Maja (with a small labour contribution from me!). Our first dance song was The Story by Brandi Carlisle. We saw her perform on an ‘unplugged’ tour at the Union Chapel in Islington the year before and will never forget how incredible it sounded. It also builds to a great crescendo, so we could really go for it. We had a great guy called Maurice, whom we’d seen before at the Earl Haig, playing Jazz/Blues piano as people arrived. Dinner was ‘build a burger’ with pulled pork and beef burgers, and then came speeches by Maja’s parents, my parents, friends of both of us from primary school, before we each did a speech. We had an amazing band, The Jukeroxx Collective, play in the evening and we danced till we were kicked out! We had great comments from our guests about what an unusual, relaxed and joyful day it was. Everyone loved singing at the ceremony, they loved the reception venue and the speeches in particular. The whole day felt like a whirlwind. A few tiny details didn’t go how there were supposed to, but none of that mattered. The overwhelming feeling between us and among our guests was joy. Everything went so well and we couldn’t have enjoyed it more. We will never forget that day. It really was the best day ever. 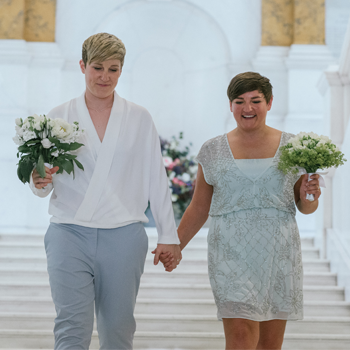 My two most memorable moments were walking into the ceremony hand in hand with Maja and feeling the palpable love and excitement in the room, gasping and looking around, and then our guests bursting into spontaneous applause. 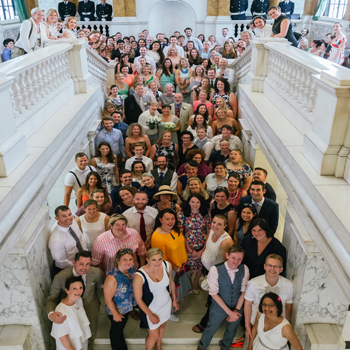 The other was pulling up in the removals van to the reception, to see all of our guests out on the pavement – and the overwhelming feeling that seeing all our loved ones together, and there for us, brought with it. Our best tip for other couples is to make your wedding perfect for you. Don’t follow convention unless it’s what you want. Everyone, including you, will enjoy all the more if it feels like it’s personal to you.